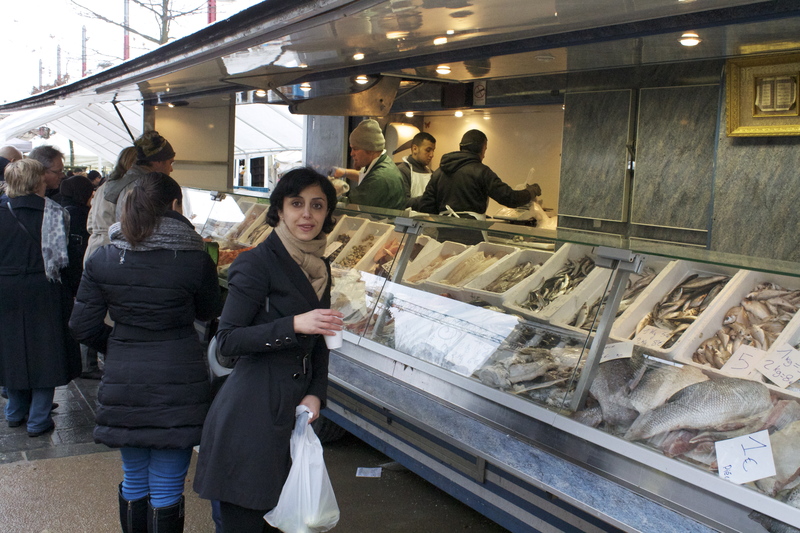 The first thing we set out to do, was to walk down the supposedly famous Brussels Midi Market, which is located right outside the busiest train station in Brussels. I’ve read this is supposed to be one of the largest markets in Europe… well…. honestly this market doesn’t hold a candle to markets I’ve seen in other parts of the world, but it was plenty busy. The actual “holiday/Christmas” market was located closer to the center of the city. 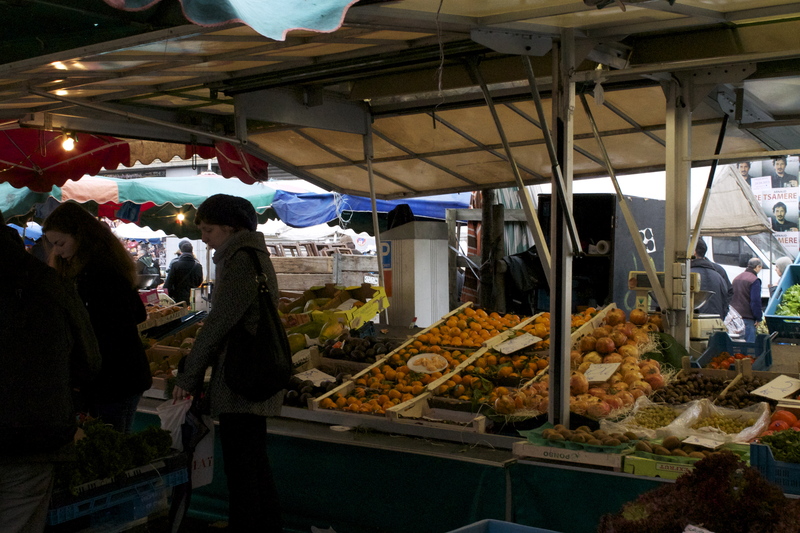 These first few shots are only of the market that runs every Sunday here in Brussels, rain or shine. 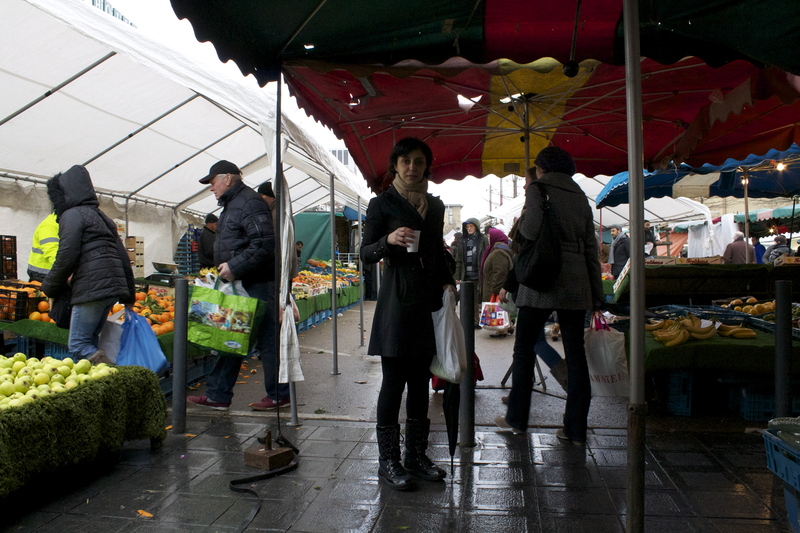 Unfortunately last Sunday we got rain… and go figure, it’s raining this Sunday as I’m typing haha… gotta love Brussels. Here’s a cool video I took of one of the vegetable stand guys, hollerin’ out at folks! 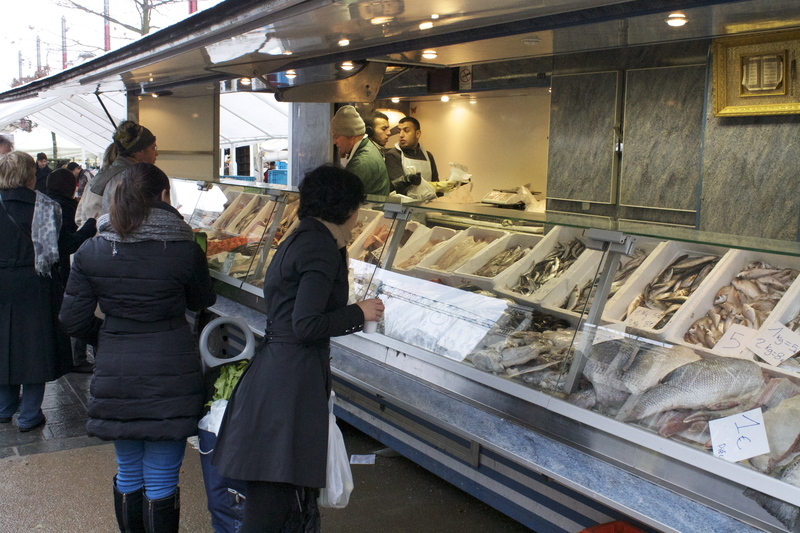 The market is mostly whole foods, like veggie & fruit stands, fish, and some meats- stuff like that. These folks aren’t really getting a deal in terms of prices… for the most part, what these vendors were charging exceeded what you could get just 100ft away at the grocery store. But I’ll give ’em the fact that the quality of their produce looked pretty exceptional, so you could justify the higher prices. Why not? So after a little while of walking, we stumbled upon this small stand with this guy brewing “Vin Chaud”. Vin chaud (in French) is probably best known as “Gluhwein” (in German) which is a traditional warm drink during Christmas. The best description I can come up with of this stuff, is that it is a combination of mulled wine, typically a port or other red wine (sometimes berry wines), heated and mixed together with various spices. Typically cloves, cinnamon, lemon, and honey are all that’s needed- but MAN OH MAN there is no better drink to enjoy on a crappy, cold-weather kind of day! I can not express how warm this drink makes you feel, and how well-rounded the flavor is too. I’ve read the Dutch add oranges to the drink instead of lemons.. I bet that would be awesome. There’s nothing more relieving for the rain and cold than gluhwein/vin chaud! Eventually R and I got cold & wet enough to head back home. After we regrouped, cleaned the snot off our faces and got some hot chow, we decided to head down for Brussels’ Grand Place to take in the Christmas sights & sounds (and smells… this is Brussels, after all). This first shot below is just a block from our apartment, and is right at the center of one of Brussels’ most busiest shopping districts, Louise. They really did the place up nicely with Christmas lights. After a quick 10-minute walk, you can reach the Grand Place from our apartment. The streets were busy and we definitely started to feel “Christmas-y” with the way the square was decorated. Their national Christmas “tree” isn’t much to write home about… so I won’t. Take a look for yourself, you might figure out why. My theory is that the city decided to string lights and plastic wrap all over an unfinished construction project, plug it in and VOILA’ (as the Belgian’s say), a Christmas tree. Much thanks to the Belgian Ministry of …. Art? Culture? Department of Public Works?? The one good thing about the whole display wasn’t the science-fair project in the middle of the square, but the lighting of all the old buildings and particularly the town hall. Actually, that was something to see and I’m glad we did. After taking it all in for a few moments, we stopped by one of our favorite dessert shops, Dandoy, and picked up some marzipan, one of R’s favorite treats. I think it’s basically almond paste with sugar, probably butter too… but it’s really really good stuff. Stuffin’ my face with marzipan! OK if you are ever in Brussels, do NOT get trapped in one of those touristy restaurants who will charge you a home mortgage just for a meal. ($$$$) GO HERE INSTEAD. This small avenue is literally lined wall-to-wall with Greek restaurants, with some of the best pita and gyro sandwiches you could ever wish to eat. And for a deal, too. I think 6 euros for a gyro? Beats 30 euros for a chicken breast (~$40). Oh, GREAT drinking food by the way. We love Mozart. So does this hotel owner, apparently. Whenever walking around taking pictures, always remember to TURN AROUND every so often, you’ll be glad you did. This is how we got this shot (above). Just watch your step in Brussels.. wouldn’t want you stepping in dog crap. Yes, this is the coolest picture you’ve ever seen. I know, and you’re welcome- cause I took it. haha… This was through the window of a local music shop. STILL heading back towards the house, we took in these cool views. See the ferris wheel? Well.. judging by the distance and direction, I think that was in the St. Catherine neighborhood of Brussels. We never got a chance to see that area. Brussels is overall a neat place to see during the holidays. That’s not where we’re spending our Christmas, though 🙂 That post will be up in a few days! Happy Holidays everyone. And a Happy New Year! This entry was posted on Sunday, December 23rd, 2012 at 1:44 pm	and tagged with Belgium, Brussels, Christmas, Christmas Market, Europe, Gluhwein, Hot Wine, Market, Midi, Photography, Vin Chaud, Wine and posted in Beers on the Road Blog. You can follow any responses to this entry through the RSS 2.0 feed.